AutoCAD's Snap to Mid Between 2 Points is a snap option that I use all the time. I love this option. 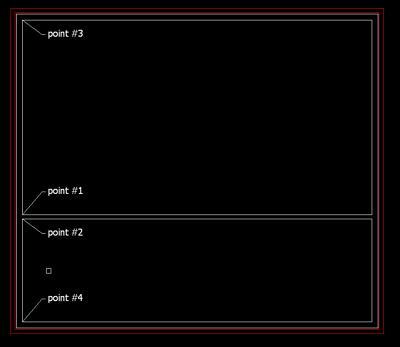 Before AutoCAD had this snap option, I used to have to draw lines to find the mid point of a room or an object that did not have an obvious mid or center snap point. For instance, I want to move the following wall within this room to split the room exactly in half without dimensioning or doing any math. 1. I initiate the STRETCH command and use a crossing window to select the interior wall. Note: If you hold down the shift key and right click, a short cut menu will appear and you can select id Between 2 Points from this menu. 3. Select the two left endpoints (P1 & P2) of the wall to be moved and hit enter. AutoCAD does the math for you and finds the exact midpoint between the two selected points. 4. To complete the wall move enter _M2P (or use the other option I mentioned) again and select the two endpoints of the left vertical wall of the room (P3 & P4) and hit enter. AutoCAD will now calculate the exact mid point between these two points and relocate the wall. Your wall should now be exactly centered within the room. This simple Snap option has saved me a lot of time and headaches. Since I started using this command I no longer draw lines to find the center of rectangles or a mid point along a wall. I also don't have to place any dimensions or calculate where the mid point should be. It can be used in many different situations where you need to find the exact mid point, whether you moving, copying, stretching or rotating.